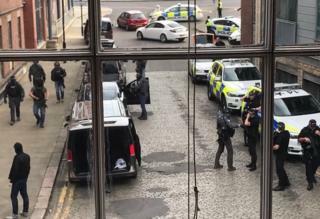 A man arrested by counter-terrorism officers on suspicion of assisting an offender has been released under investigation. The 23-year-old, from Sheffield, was one of three men detained following a series of raids in Yorkshire. Two men, aged 24 and 29, were arrested in Huddersfield and Sheffield on Thursday on suspicion of terror offences. Both men remain in custody. Police said the arrests were not linked to the recent Manchester Arena attack. The BBC understands the arrests are Islamist-related. 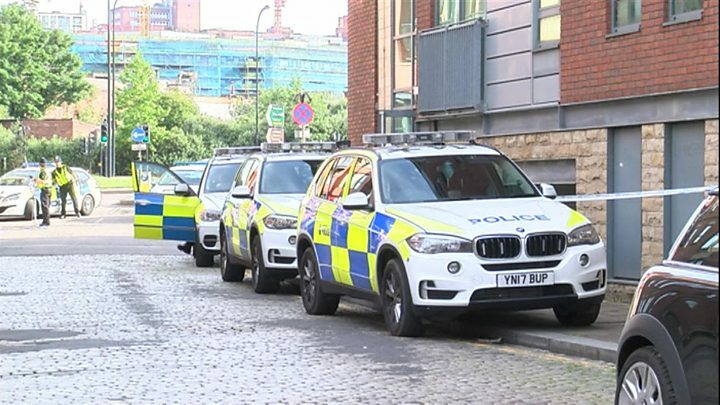 The raids took place at the Daisy Spring Works apartment block in Kelham Island, Sheffield and in Rudding Street in Crosland Moor, Huddersfield. Nick Meeks, who lives on the same floor as the flat in Sheffield which was raided, said he heard an "almighty explosion". "I stuck my head out of the door and there were fully-armed police pointing guns down the hallway towards me screaming and shouting at me to get back in the flat," he said. Media captionA man living in flats raided by anti-terror police says he heard an "almighty explosion"
A resident in Rudding Street, Crosland Moor, Huddersfield, who did not wish to be named, said at one point his "house shook". He said: "I heard a loud bang that sounded like a really big explosion, I thought it was a bomb. "I ran outside and saw about 30 police and armed officers. People on the street have been kept inside their houses." The North East Counter Terrorism Unit said the explosions in both locations were caused by police accessing properties. Police added that searches at both properties had been concluded. Image caption Residents in the Crosland Moor area of Huddersfield reported hearing "loud bangs"